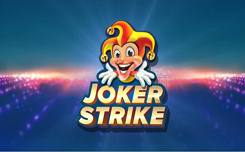 Joker Strike – a new slot with a classic theme from the popular company Quickspin. 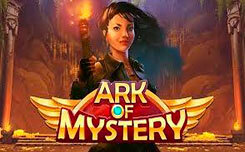 Despite the fact that the slot has a classic theme, it looks quite new, and has a number of additional features that will pleasantly surprise all lovers of traditional slots. 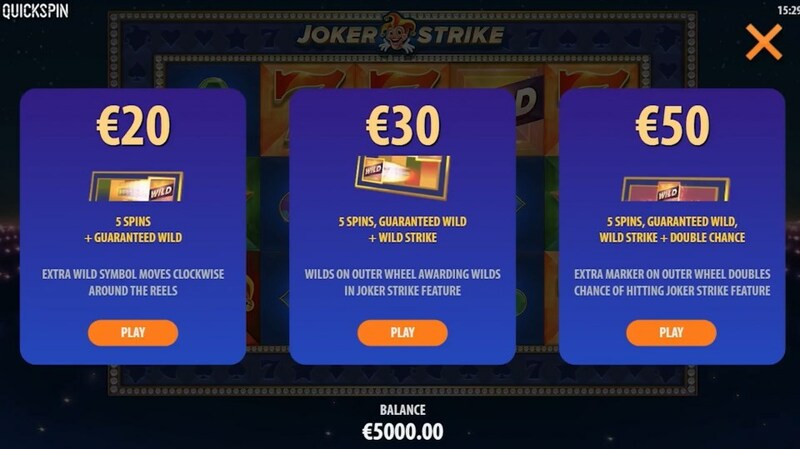 The new game has a standard game structure, five reels and 10 winning lines, with a minimum bet of 0.10 euros for one spin, from the new products that you can see in the new slot can be noted: the same function Joker Strike and specially designed mode Hi Roller, where you can buy 5 spins with additional wild symbols. The design of the Joker Strike slot a minimalistic, however, like any classic slot. The game screen is located on the background of the burning lanterns of Las Vegas, and on the drums you will see the traditional symbols of the classic slots: Diamonds, Seven, Stars, Bells, Standard card suits, and also the symbol of the Joker (Jester with bells on the hat). 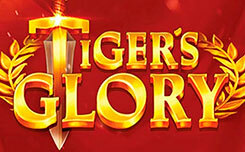 The Wild symbol has the form of a silver letter “W” it replaces absolutely any symbol of the new slot. 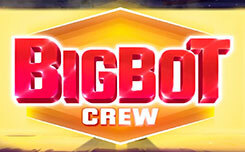 Bonus features slot Joker Strike. 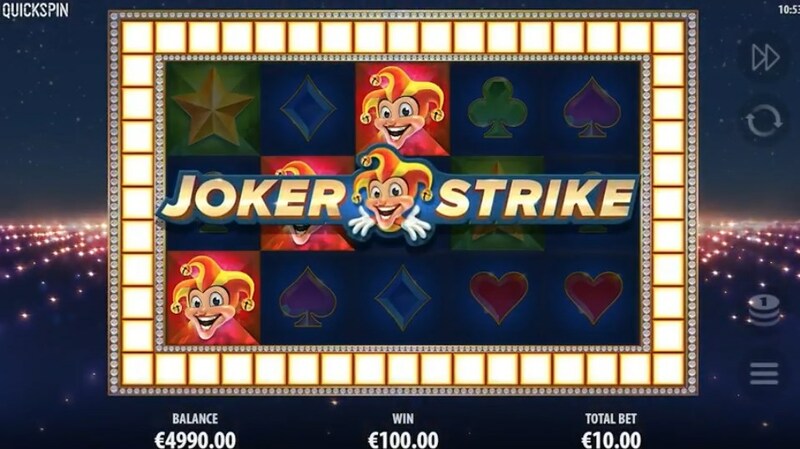 Joker Strike function – it is activated when any winning combination is lost, in case of loss, pay attention to the outer contour of the game screen, on it (on an opaque background) all the symbols that are present in the new game are located. If the combination is the same, the outline is highlighted with yellow light, and the falling symbols are distributed around the contour, here, pay attention to the moving square that moves clockwise, if it enters the sector with the active symbol, you get additional spin, and up to 10 additional symbols are added to the screen. Function – Hi Roller is activated by pressing a special button at the bottom of the game screen. 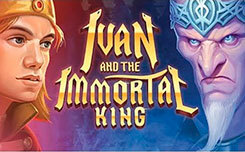 Here you can choose three modes, (five spins) each of which has its own specific bet and additional functions. The first function (20 euros) – if the winning combination is the same, an additional winning square appears on the outer contour. The second function (30 euros) – an external wild symbol appears on the outer contour. 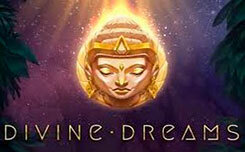 The third function (50 euros) – on the outer contour appears four additional wild symbols, which significantly increases your chances of a big win. Note that when you select any function hi roller, an additional wild symbol appears on the screen, which will also move clockwise and complete the winning combination. 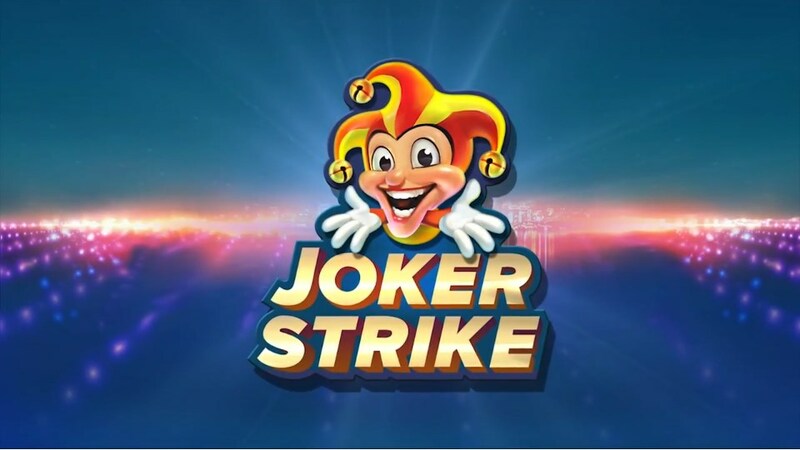 Drawing a conclusion it can be said that the new Joker Strike slot is a unique classic slot with an excellent set of additional bonuses that will surely bring players big wins and only positive emotions during the game.